ARCA is actively seeking motivated and qualified individuals seeking employment in our field of work. If you are interested in a fast-paced, exciting and challenging environment, please send us your resume and work experience to jobs@arcanc.org. Winston-Salem, NC September 19, 2016 – Addiction Recovery Care Association, Inc.(ARCA) is holding an open house and building dedication for its new administration building on Thursday September 22 at 12 Noon. The new “Abernethy Administration Building” is approximately 4,000 square feet. It includes 8 offices, a reception/admission area, conference/board room and employee break room. The building is located on ARCA’s campus in southeastern Forsyth County. Mr. Abernethy was instrumental in the inception of (back then) the Alcoholism Residential Care Authority in 1969 in downtown Winston-Salem Mr. Abernethy has been an advocate and supporter for ARCA ever since. ARCA moved to its current location in 1975 after the Air Force Radar Station closed. The much-needed office space will help ARCA to continue to fulfill its mission to provide treatment services. As part of its strategic plan, the new building lays the foundation for ARCA to build on its success and expand to serve more people. About ARCA: Founded in 1969, ARCA is a non-profit organization governed by a volunteer board of directors. There are usually less than 50 clients being treated on the ARCA campus at any given time, which allows for highly specialized individual care. The open space and farmland surrounding the ARCA campus provides an ideal setting for treatment and recovery. The ARCA campus includes a dormitory serving both women and men, a dining hall, meeting/counseling rooms, a separate building for family group programs and outdoor recreation areas. As a result of the care received from ARCA, hundreds of recovering clients have returned to their families and jobs as valuable members of their communities. If you or someone you know has a drug or alcohol problem, ARCA can help. A CARF three year Accreditation was awarded to ARCA for Substance Abuse Detoxification and Residential Treatment Services. CARF accreditation demonstrates ARCA’s quality, accountability, and commitment to the satisfaction of the persons served. 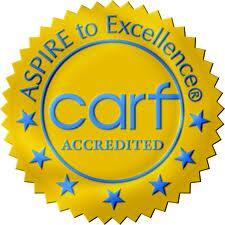 CARF International is an independent, nonprofit accreditor of health and human services providers in the areas of Aging Services, Behavioral Health, Child and Youth Services, Durable Medical Equipment, Employment and Community Services, Medical Rehabilitation, Substance abuse Treatment Programs, and Vision Rehabilitation Services. For more information on CARF, visit www.carf.org. Applications will be reviewed and selected candidates will be contacted by ARCA to schedule an interview. The Commission on Accreditation of Rehabilitation Facilities CARF has again accredited the Addiction Recovery Care Association ARCA for its detoxification and residential substance abuse treatment programs. CARF is an international independent, nonprofit accrediting body whose mission is to promote the quality, value and optimal outcomes of services. CARF assists organizations in learning how to measure and improve the quality of their programs and services. The three year accreditation decision represents the highest level of certification that can be awarded to an organization. It reflects the ARCA’s substantial conformance to CARF standards. This accreditation process has demonstrated that ARCA’s programs and services are of the highest quality. This latest accreditation is the second consecutive three-year accreditation that the international accrediting body has awarded to ARCA. ARCA as a 501(c)3 non-profit, fully licensed and accredited organization, with a 40 year history is a recognized as an established leader in the residential substance abuse treatment community. ARCA incorporates current best practice approaches with the well-established and highly successful 12 step models to meet it’s mission to serve individuals with Substance Use Disorders and, to educate the families and the community about the recovery process.